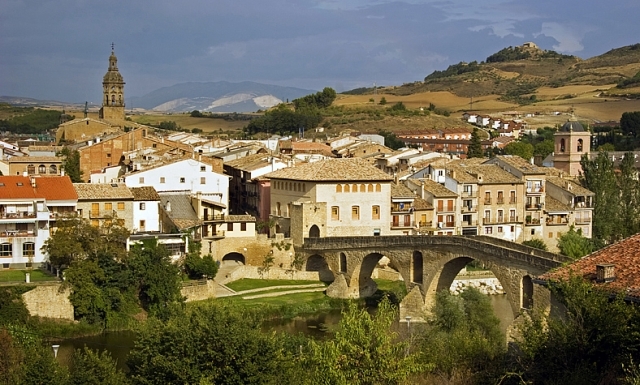 A milestone on the Jacobean route, this small and quiet town, almost freed from traffic and growing in population due to the opening of the motorway of the Camino still retains its original Calle Mayor, the initial street to this urban stretch. Here the pilgrims will find all kinds of services tailored to their needs. This enclave, founded in the XII century by Alfonso I the Battler, was historically a crossroads where the route from Roncesvalles and the Aragonese route from Somport unite. Even today, the influence of pilgrimages and, the continuous passage of walkers, characterises the daily life of this town, born by and for the Camino. The bridge from which the centre takes its name, one of the most beautiful examples of Romanesque architecture and most frequently photographed of all the way ancient, prepares to bid farewell to travellers. If the travellers arrive in Puente la Reina between the 24th and 30th of July they can join in with the celebration of their festivals in honour of Santiago. During which there is music, bullfights, dances and various shows. On July 25th there is a saint's day, celebrated with a flag salute and those of the brotherhood of the town. In the case that pilgrims visit the centre during the last week of September they will encounter fairs, including its famous race, a competition in which participants on varied agricultural vehicles and tools race to pass the finish line first. Now in a more Jacobean environment, the Gomacín society invites those pilgrims spending the night on December 28 to a free dinner. In summer, another alternative for travellers arriving to the enclave early is to go to the local swimming pool, it offers special prices for pilgrims. If you are traveling on the Camino de Santiago or are planning to do so soon, you should know that the distance separating Puente la Reina from Santiago de Compostela is 685 kilometers.